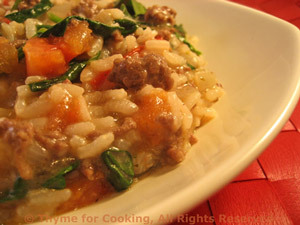 Sunday Supper: Beef and Spinach Risotto. This is one on the few times in winter that I use fresh, 'store-bought' tomatoes. Get the nicest ones you can find... within reason. They're cooked so, really, any will work. This should finish the spinach. Something seasonal - Mandarin oranges, perhaps? Serve.. Don't forget the fruit!